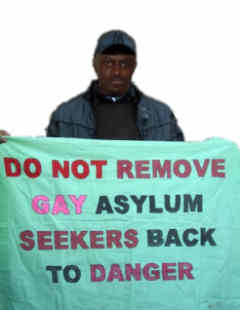 LGBT Asylum News: Video: Is Ugandan 'kill the gays' bill dead? Video: Is Ugandan 'kill the gays' bill dead? This Ugandan media report calls it a "surprise move" that the administration of Ugandan President Yoweri Museveni has apparently pulled support for the Anti-Homosexuality Bill (AHB). But the bill is still in the Ugandan Parliament and its author David Bahati MP says that he still has support there. Throckmorton reports that Ugandan radio has said that Bahati has been assured by the Legal and Parliamentary Affairs committee chair Stephen Tashobya that the AHB will be debated. He previously told him that it has been scheduled for debate now that the elections are over. The bill has been in the Parliament’s Legal and Parliamentary Affairs Committee since last April. A sub-cabinet committee recommended last April that the bill be dropped with “useful provisions of the proposed law” incorporated into the Sexual Offenses Act. Burroway notes that that the bill’s main supporter in the cabinet, former Ethics and Integrity Minister James Nsaba Buturo, resigned last week in compliance with a court order following his loss in the ruling party’s primary elections last year. Museveni last year strongly suggested that international lobbying directly of him, including by heads of state, about the AHB would lead to the bill being dropped. However he has also noted domestic pressure on homosexuality and notably he complained publicly last year about a local political cartoon depicting him on this issue as a puppet of US Secretary of State Hillary Clinton, former Prime Minister Gordon Brown, and Canadian PM Stephen Harper.